Joint Trade Union Movement (JTUM) president Ancel Roget has accused the ruling PNM Administration of placing the nation’s security at risk by giving priority to “balancing their books” and not giving the police adequate resources to fight crime. Addressing a mobilisation exercise at Busy Corner, Chaguanas for the labour movement’s day of rest and reflection on September 7, Roget renewed his call for the removal of the Minister of National Security, Edmund Dillion saying some 290 persons had been murdered for 2018. 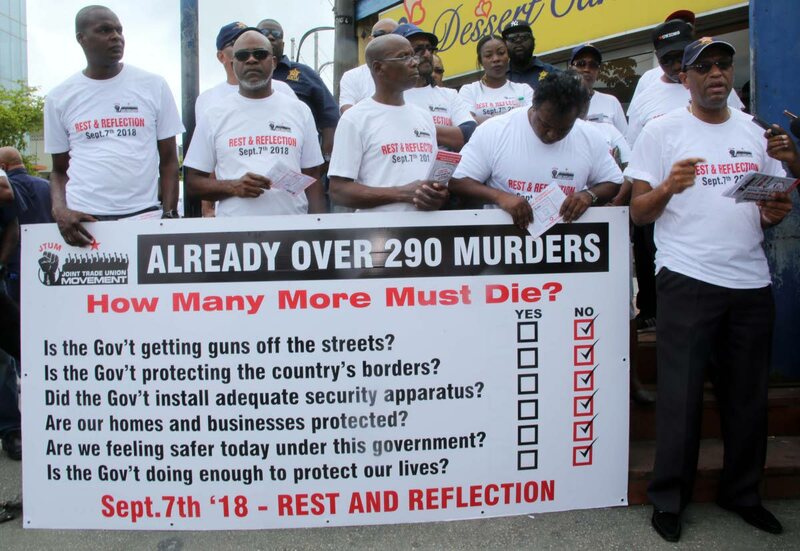 Under overcast skies, JTUM members, most of whom wore white t-shirts with the words ‘Rest and Reflection, September 7, 2018” written on the front while on the back- ‘Too much murders, too much guns, protect our lives’- was written, distributed flyers to pedestrians and motorists. He said the business chambers should also join with the labour movement’s call for Dillon’s removal saying they were also under attack by the criminal element. Roget said the recent police action to recover the cell phone of a senior government minister’s son was further evidence that they were only willing to use state resources when a crime had been committed against one of their own. Reply to "Roget says PNM choking the economy"